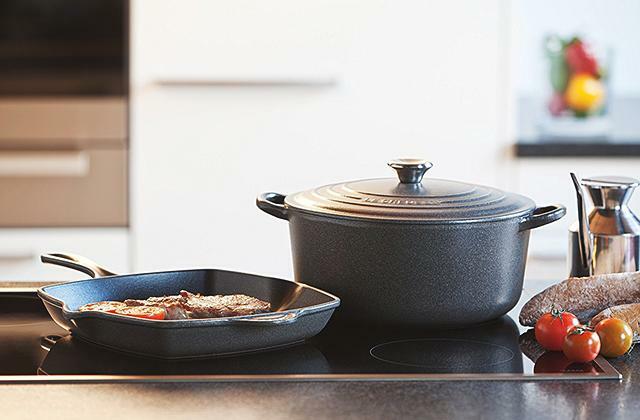 Made of impact-resistant ceramic, this kitchen steel won't rust or dent. 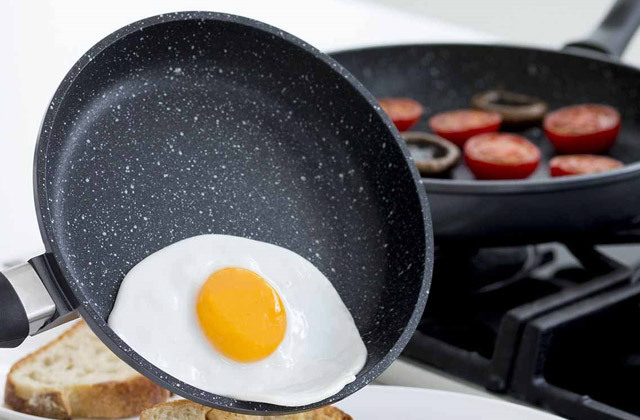 Has a glossy appearance to match perfectly any kitchen design. Easy to clean and maintain. Due to its bulky weight, the sink might be quite difficult to install without professional assistance. 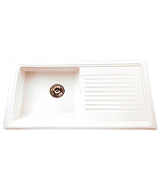 Despite its white finish, the sink requires very little maintenance and cleanup. Given its big capacity, it will fit spacious kitchens perfectly. A good choice for those who value quality and durability. It's a sturdy and durable kitchen sink that has relatively small dimensions. 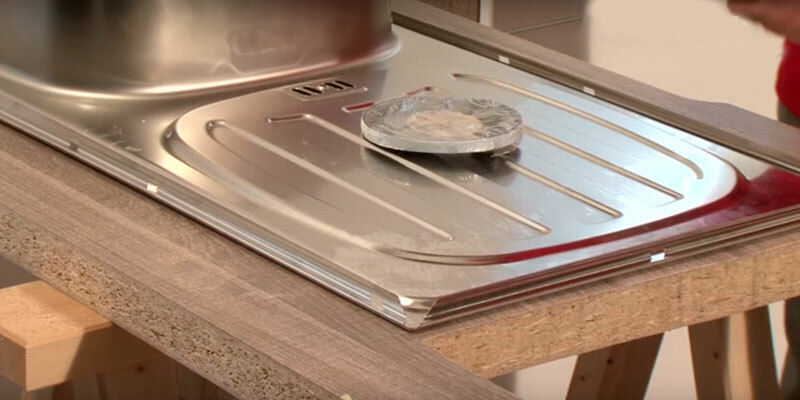 Due to two installation options, it can be placed both under and flush up with the countertop. The sink doesn't dinge nor bend and comes at a very attractive price. It doesn’t have a drain board. This stainless steel kitchen sink will be a nice option for all those who seek for a minimalistic design to add a contemporary touch to their kitchen interior. The alloy boasts a 1.4301 chrome-nickel steel rating. It does not require much in terms of maintenance. It is virtually invulnerable to mechanical damages. And, just like any other high-quality stainless steel alloy, it isn't particularly prone to rust and corrosion. The steel is a little flimsy around the tap areas. 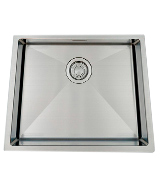 We would recommend the Pyramis 100120402 CA1 kitchen sink unit to anyone with limited kitchen real estate. It doesn't cost too much. The construction is sturdy and dependable. Plus, it is really easy to install. 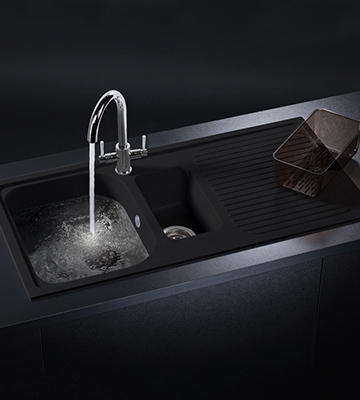 Made from natural granite, this first-class reversible kitchen sink won't rust nor pose any threat to your health. It should also serve you for a long time due to its excellent wear and heat-resistance properties. The instructions might seem not clear enough. 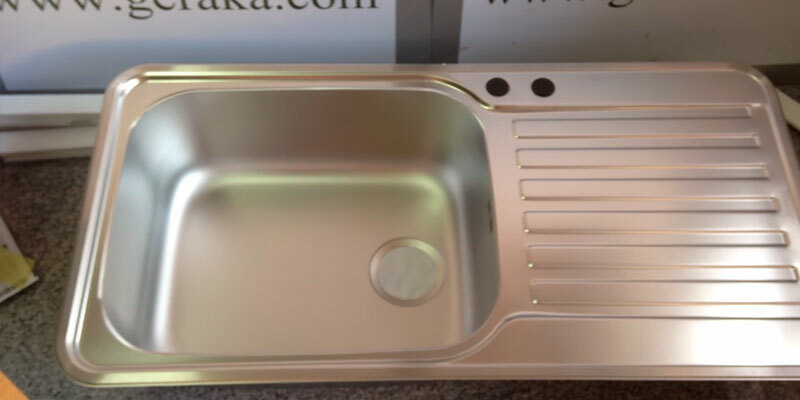 If you look to buy a durable and long-lasting kitchen sink of high quality and don't mind paying a little bit extra for it, this granite kitchen sink from a renowned German producer will fit the bill. Equipped with sound dampening pads, the Grand Taps A11 MR offers quiet performance. 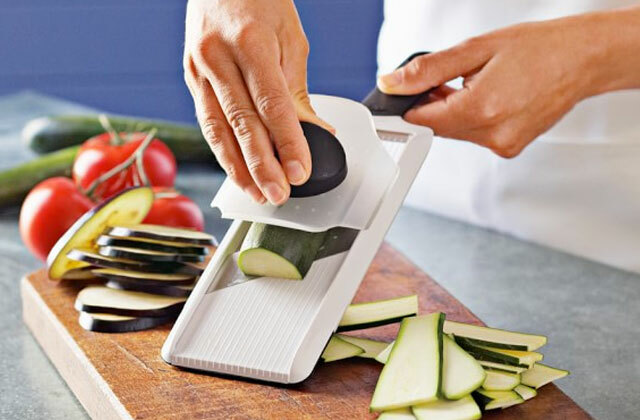 Perfect for small kitchen spaces. The bowl capacity is rather small. 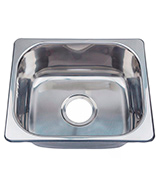 This stainless steel sink from Grand Taps will be ideal for those who are looking for a compact bowl made in a minimalistic design to suit small-sized cabinet or countertop. Simple, affordable, and robust. Ceramic kitchen sinks have always been on trend. Extremely durable and beautiful, they are able to elevate the interior of any kitchen. Furthermore, ceramic is known for its excellent resistance to stains, scratches, and heat. Even if you put something hot in the sink made out of ceramic, there won't be any marks left. Moreover, ceramic is very easy to clean. Wiping it clean with a wet cloth or sponge will be enough to maintain its clean look. 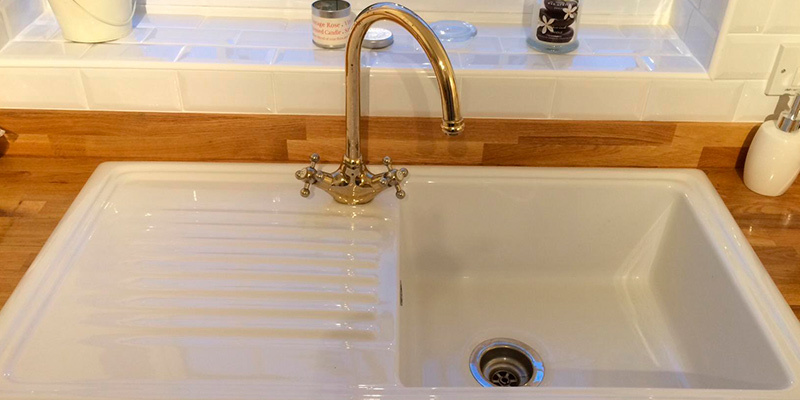 For these very reasons, we'd like to offer you to take a close look at a ceramic sink by Reginox - a white single-bowl sink with a glossy finish designed specifically for all classic traditional kitchen designs. The Reginox sink is a fully reversible type, which means the drain can be fitted both on the left and on the right of the sink. The tap holes are partially pre-drilled so you can easily punch one through when you decide on the sink orientation. Along with the sink, the package includes a waste kit that comes with a lower saddle to prevent the water from overflowing and filter out debris. What you will need to purchase separately, though, are a tap and a basket. When you've got all the fittings for the sink, it's time to make a faucet hole for a tap. As we've mentioned above, all knockout areas are already pre-built at the factory; you will only need to decide where to install a tap. Take a hammer, a punch, a file, and safety goggles. Place the punch in the center of the hole-mark and jar it downwards with the hammer. Do not apply too much force in order not to damage the sink. Then gently knock out the remaining material with the hammer and keep filing the hole until it's all clean. Now you can mount a faucet. If you're on a budget but still want a sink that would add a beautiful touch to the interior of your kitchen, you won't go wrong with the L550400 kitchen sink. 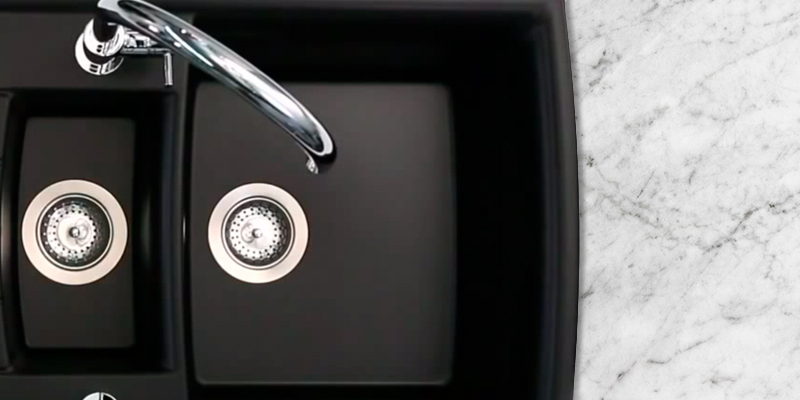 Produced by a leading Dutch-based company COPA Design, this sink stands out for its durability and robust design. Interestingly, this company specializes in manufacturing goods only from stainless steel and by intent don't use any other materials. Wonder why? The company doesn't see any point in overpaying for expensive materials when they can produce the same quality products at lower costs. Though stainless steel doesn't look as luxurious as granite or ceramic, it does boast some great advantages which make it so popular with thousands of manufacturers. First of all, stainless steel is affordable. 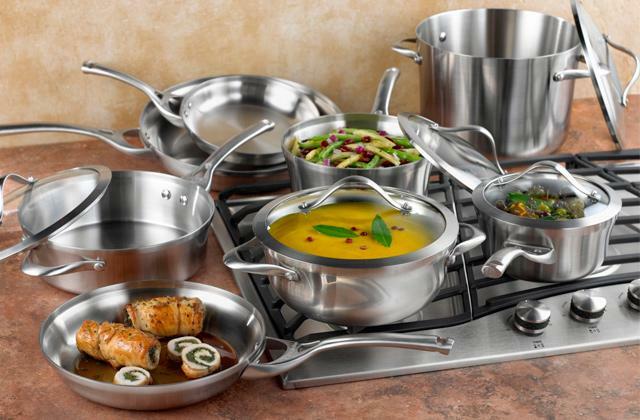 Secondly, stainless steel is less prone to peeling, cracking, and chipping. Thirdly, it is highly resistant to corrosion and abrasive cleaners. And lastly, it allows for a wider range of styles, shapes, and designs. Thus, if you haven't had an intention to spend an arm and a leg on a sink, the L550400 by COPA Design can be your best bet. 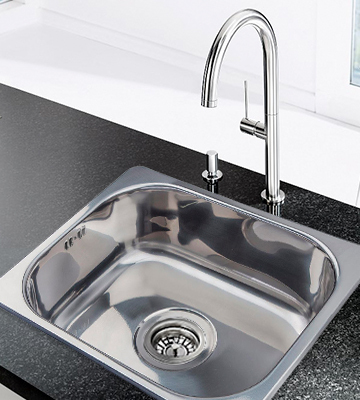 Designed to fit in small spaces, the COPA Design L550400 sink will blend nicely with your kitchen interior. It is deep enough to accommodate plenty of dishes and thick enough to stand to test of time. What makes the COPA Design L550400 even more popular is the fact that it can be mounted in two ways - under and flush up with the countertop. If you haven't decided yet on the installation method that's right for you, the COPA Design gives you a chance to think about it later on. 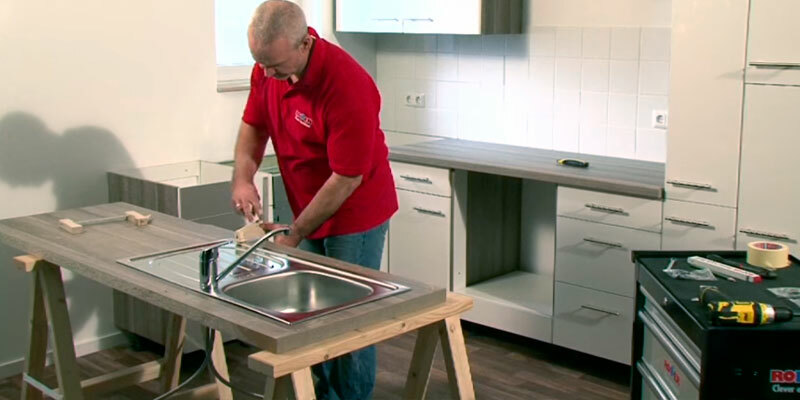 The L550400 sink comes with a 3 1/2 waste kit designed to be used as a plug and prevent floods. We doubt very much you will need professional help to mount this sink. It is very easy to assemble. However, if you have any issues, you can consult the detailed instructions that come included in the kit. Do not clean it with metal scrubs; this may set a rusting process. Pyramis 100120402 doesn't really present any new ideas and, for the most part, we'd say that it is the model's biggest strength. Kitchen sinks don't have to be original. They need to be functional, practical, and convenient. It doesn't hurt when they look good too. And we can't say that that's not the case. 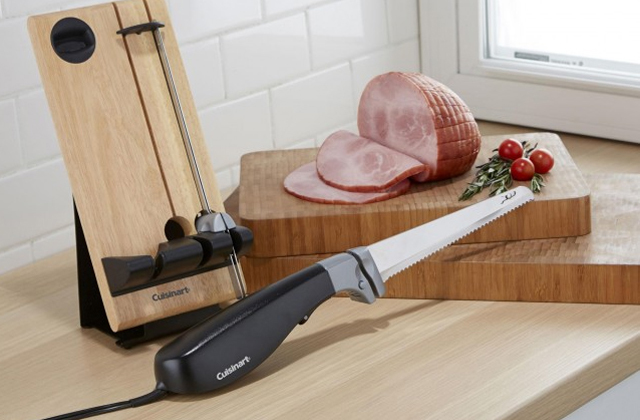 Made of stainless steel, the unit looks sharp, slick, and polished. It's that contemporary design that is both familiar and suitable for most kitchen interiors. 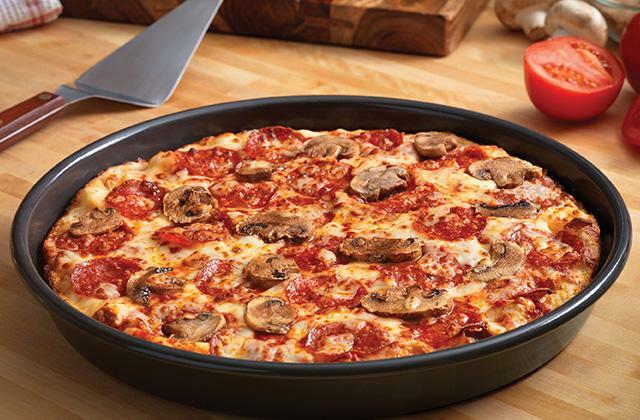 By the way, this isn't your run-of-the-mill stainless steel. The alloy in question boasts a 1.4301 chrome-nickel steel rating. It does not require much in terms of maintenance. It is virtually invulnerable to mechanical damages. And, just like any other high-quality stainless steel alloy, it isn't particularly prone to rust and corrosion. Now, as far as ergonomics are concerned, this is a fairly small sink. Its waste outlet diameter adds up to 60 millimetres. So, as you'd imagine, it won't fit more than a bowl. The whole thing adds up to 860 mm in width, 150 in height, and 435 mm in depth. Of course, that's the external dimensions, while the basin is closer to 365 x 335 x 150 mm. 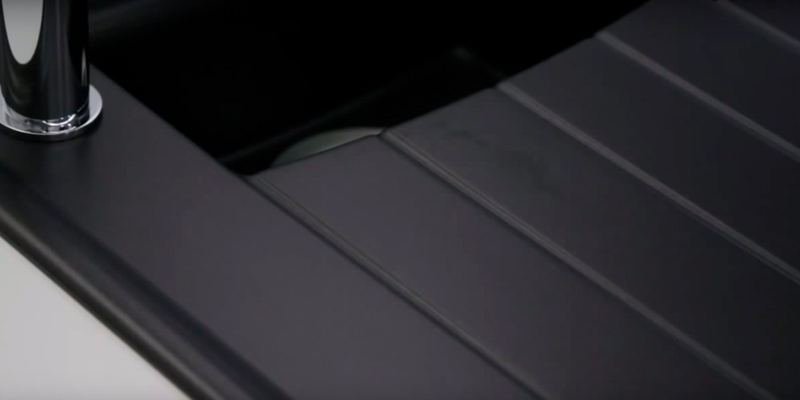 This is an inset sink, so it probably won't be too difficult for you to install it. Plus, every material that's required for installation already comes with the sink, which is always a plus. Other than that, the model is more or less your typical square sink. 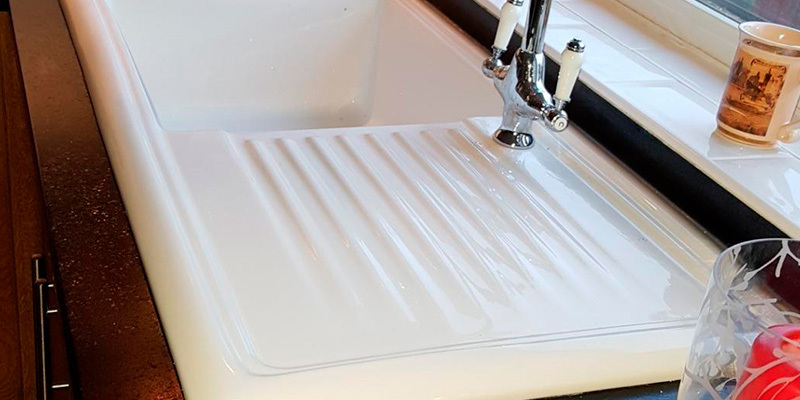 There's a draining board and the construction is reversible, so you can turn it left or right to fit your particular setup. It comes with a plug valve and doesn't include a tap hole. The draining board is probably the best part of this kitchen sink. Of course, it's nothing we haven't seen before. 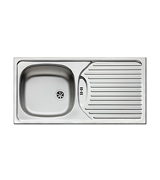 But, for a small sink unit, it has quite a lot of space, probably more than enough space for your dishes. It comes equipped with its own ergonomic drain, so you can just put your wet dishes there and the water will flow down the drain. 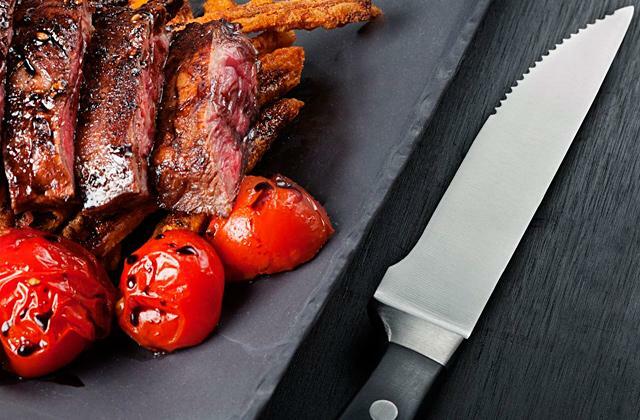 You can use it as a cutting board. The last order of business here is probably the polyurethane foam seal. Though there's nothing we can say about it except that it is durable and reliable, able to prevent leakages for years to come. All in all, we would recommend the Pyramis 100120402 CA1 kitchen sink unit to anyone with limited kitchen real estate. It doesn't cost too much. The construction is sturdy and dependable. Plus, it is really easy to install. If you ponder on an idea of buying a granite kitchen sink, there are many good reasons why you should do that. For starters, granite sinks are very durable and will easily last you years with no visible damage done to the surface. Unlike many other materials, granite is highly resistant to stains, cracks, household acids, and high temperatures. Granite is also very easy to clean. It's enough to wash it with water and soap to maintain its shiny, luxurious look. Granite sinks are available in a whole range of colours. The only problem with them is that they aren't cheap. If the price isn't an issue for you, buying a sink from granite may become your long-lasting investment. 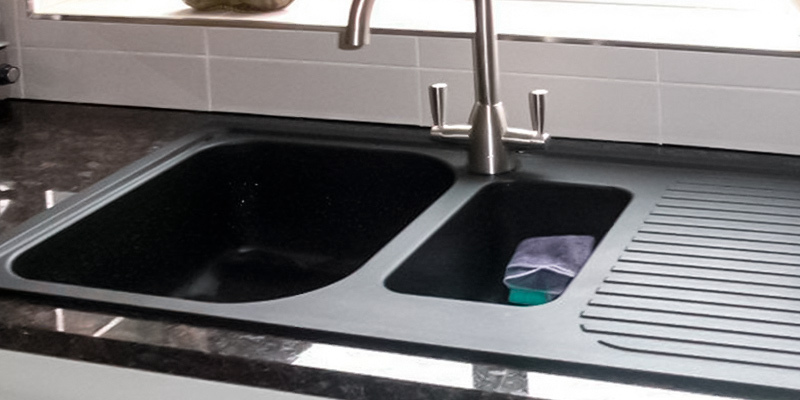 When it comes to the best kitchen sinks made from granite, we'd like to single out one that stands out of the pack - the sink from Schock, a German-based company that gave the start to the Schock method which is now used by most of the companies producing granite kitchen sinks all over the world. 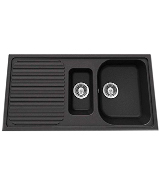 The Schock Lithos D150 1.5-Bowl Granite Kitchen Sink is a classy Onix Black sink with a matt finish that features fully reversible bow configuration and comes with two bowls. Like in most of the contemporary kitchen sinks available for sale, the drain here can be mounted on both sides of the sink, so you can choose the placement that will fit the rest of the components with little alteration required. Each bowl comes with a removable basket strainer waste for trapping food debris. What many customers like about the Schock Lithos D150 Granite Kitchen Sink is that it doesn't seem to collect any stains and dirt and that it's non-porous finish surface doesn't allow for bacteria spread. Add to that the fact that granite doesn't tend to absorb any unpleasant smells, and you get the best features of a kitchen sink, packed in one product. 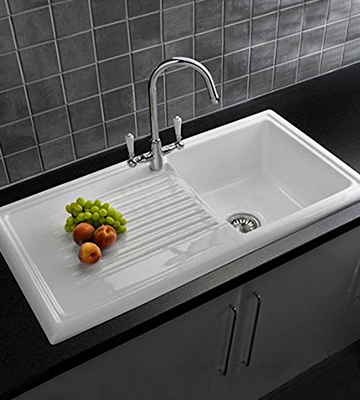 If you seek for something small to fit in the confined kitchen, choose the sink from GrandTaps UK. As this kitchen is of inset style, it doesn't require a lot of space and it can be mounted in a cabinet or countertop of any type and size. 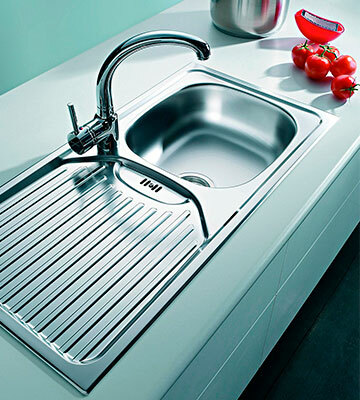 Despite being quite affordable, the Grand Taps A11 MR Stainless Steel Kitchen sink features a durable design. Given that it is 0.8 mm thick, it will easily last you years. Along with the sink, the manufacturer supplied the box with sound deadening pads, a chrome strainer waste, and overflow and fixing clips, so you get everything needed for the installation of the sink. Although the Grand Taps A11 MR has a single bowl, its robust design with polished stainless steel contemporarily look makes this sink perfect for those who need a simple and practical kitchen sink that will look good in their kitchen. 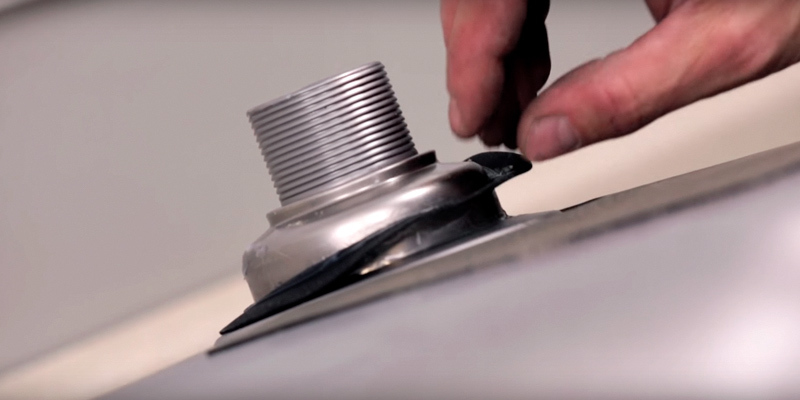 Despite the fact that stainless steel kitchen sinks are heavy-duty and solid, they do need some additional protection. 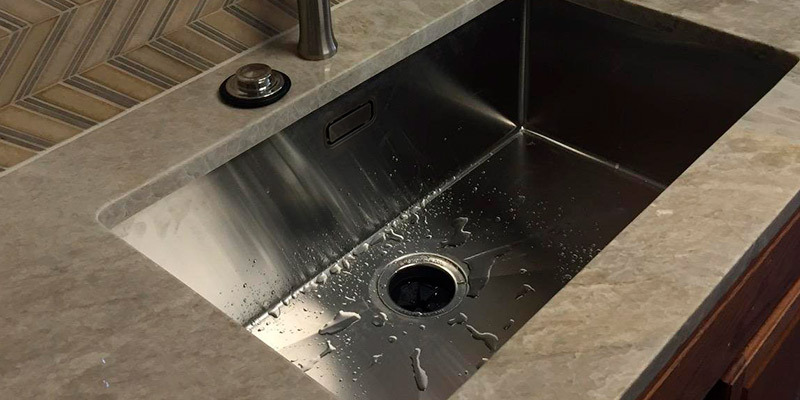 As most of the utensils we use tend to leave marks on the polished surface, use a special stainless steel grid to keep the bottom of the sink protected against scratches. Aside from the protection, you can also enhance the functionality of the sink. Install a soap dispenser for dishwashing liquid or hand soap. 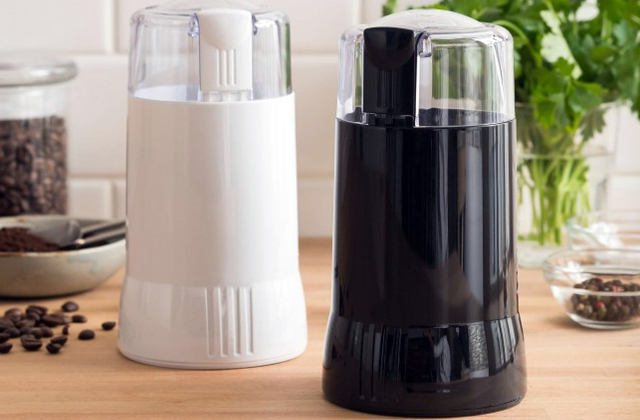 Unlike regular bottles that tend to fall down into the sink, dispensers stay in place. 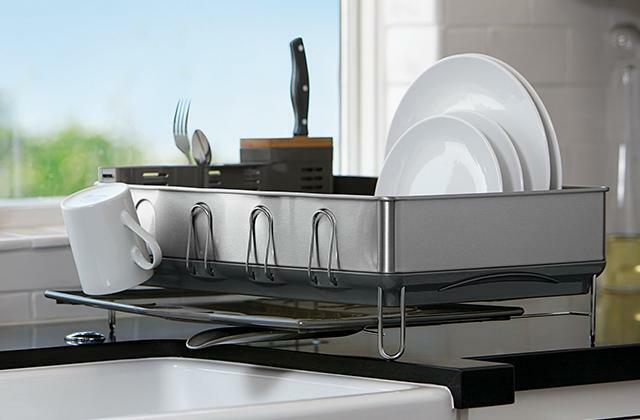 You can also purchase a workstation for keeping your cutlery well organized. What else you may want to add to your sink is a sink caddy, a handy item used for storing scrub brushes, sponges, and other small things in one place. What Is a Kitchen Sink? A kitchen sink, along with a cooker and a fridge, is one of the most used units in a kitchen. Nowadays it is impossible to imagine our life without it. We do a lot of washing in the sink; some people even use it as a bathtub for pets. With that, it comes as no surprise kitchen sinks come in such a variety of models, shapes, and materials. 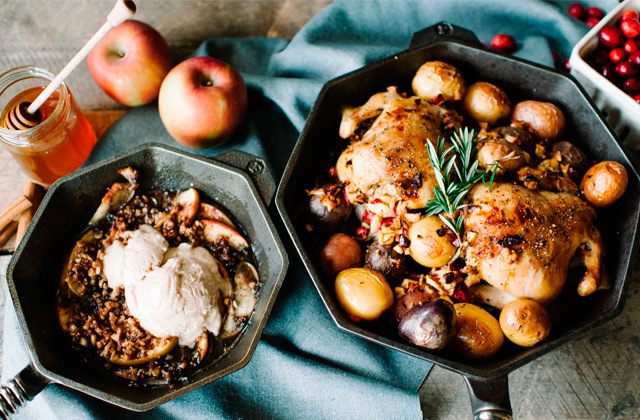 You can find a kitchen sink for any taste. However, before you go purchase one, answer a few simple questions. How many bowls do you want it to have? What size and shape do you like best? What type of material should it be made from? 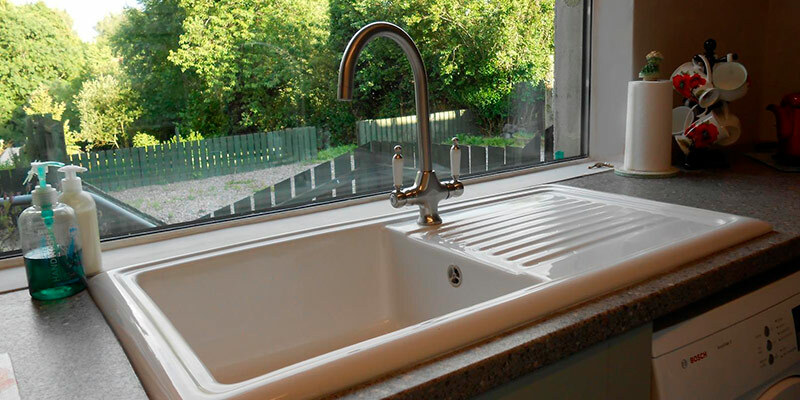 The kitchen sink should suit your kitchen interior as well as be durable and resistant to stains and rust. 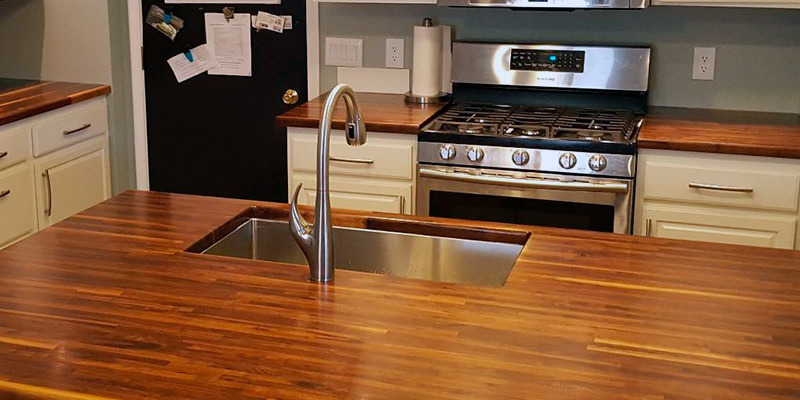 As soon as you settle on all these questions, more likely than not you will be able to find the best kitchen sink for your kitchen. If you'd like to reduce the time needed for washing dishes by hands, we can offer you to take a look at our selection of the top-rated dishwashers you can find on the market today. Buying the dishwasher will not only save you the stress of washing dozens of dishes while hovering over the sink but will also reduce the electricity bill. Kitchen sinks come in a whole variety of materials. 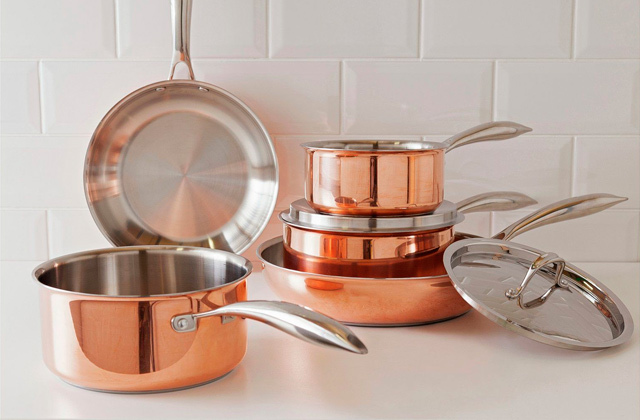 The most popular are stainless steel, ceramic, cast iron, solid materials, acrylic or copper and bronze. Despite the fact that they are all known to be pretty durable, each of the materials has its own pros and cons. 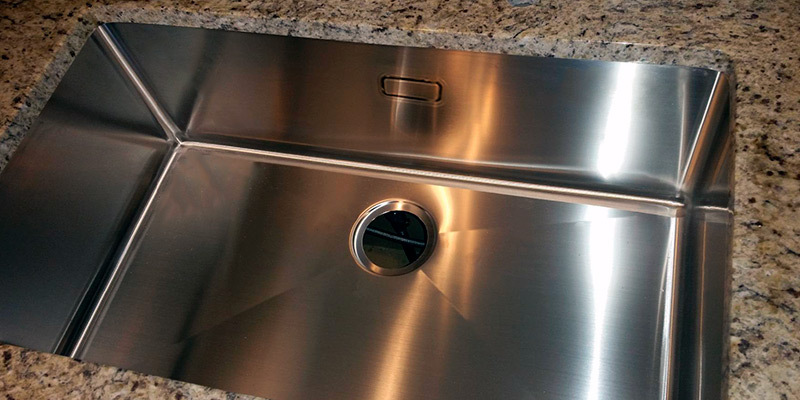 As a rule, stainless steel sinks are presented in a bigger variety of styles, shapes, and sizes than other kitchen sinks. What some people may not like about them, though, is that they are easily marked and that they aren't very much attractive. Granite sinks appeal to people more in spite of the fact that they require more frequent cleaning. Cast iron and ceramic sinks are rather heavy and therefore may be more difficult to install. However, they do look beautiful, which is why a lot of people don't mind busying themselves with their installation. If you're looking for an unusual kitchen sink design to complete the interior of your kitchen, you may want to consider models made of copper and bronze. Would you prefer to have a sink with a single bowl or a multiple bowl? Have you got a dishwasher or you wash dishes by hand? Maybe you'd like to have a kitchen sink with a separate bowl for soaking dishes? Understanding your basic family needs, you should be able to determine what sink configuration is right for you. A single-bowl sink is a traditional option that is widely popular with consumers who have small kitchens. Double-bowl sinks can offer you versatility by providing some additional space for dishes, fruit, vegetables, etc. If you've got enough room in the kitchen, you may like to have a sink with a triple bowl. The methods of kitchen sink installation can be roughly divided into three basic types: top mount, under mount and flush mount. The top mount, which is also called as inset or drop-in, is considered to be the least time-taking installation method. All that you need to do is insert the sink into a cut-out opening in the countertop. Under-mount sinks are installed below the countertop. According to the design of your kitchen, the under-mount sink can be either secured below the countertop or installed flush with it. The flush mount type is very similar to the top mount except that the sink comes with a big panel and requires a different cabinet type. Q: What is a sink gauge? 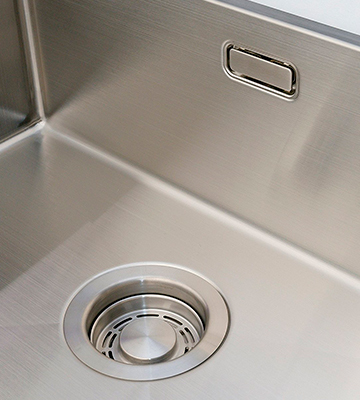 A: The gauge means the thickness of the stainless steel sink. The lower this number is, the thicker and better the sink will be. If that's possible, though, make sure to examine the sink yourself. The material should not bend or dinge. This is especially important if you've got a heavy-duty faucet to install. Q: Do stainless steel sinks rust? A: The answer is no, unless you give it bad care. To maintain your sink in a good condition, never forget to clean it after usage; however, don’t use household chemicals that contain chlorine or hydrochloric acid. In case you use a steel wool, make sure that it is made of stainless steel material. 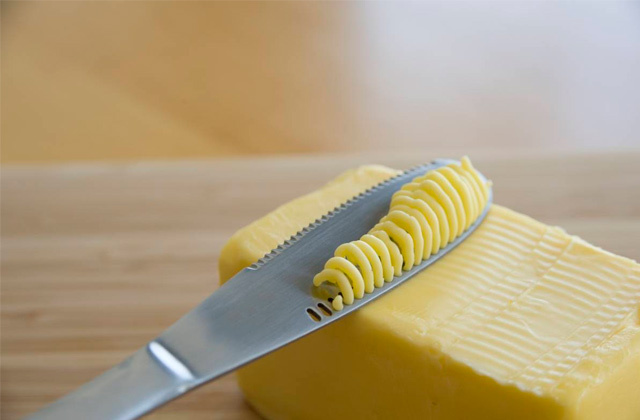 What is more, avoid long-term contact with salty liquids and iron or cast iron objects. If you follow these simple tips you will never have any rust on the sink. Q: Are stainless steel, ceramic and granite sinks food-safe? A: Yes, they are. All of them are tested for the food safety. Q: Are granite sinks available in multiple colour options? A: Yes, there are. You can choose from hundreds of options to suit any interior. What you might not be able to change, though, is that they all come with a matt finish. Q: Do all kitchen sinks have a faucet and other fittings? A: It depends on a manufacturer. A faucet is rarely included in the kit, whereas waste and overflow kits always come with the sink. Q: How do I know whether I need a left-handed or right-handed sink? A: If you'd like to have a bowl on the left side and the drain on the right side, then you will need to look for a right-handed sink configuration. And vice versa. If you prefer the bowl to be on the right side and the drain on the left, opt for the left-handed sink. 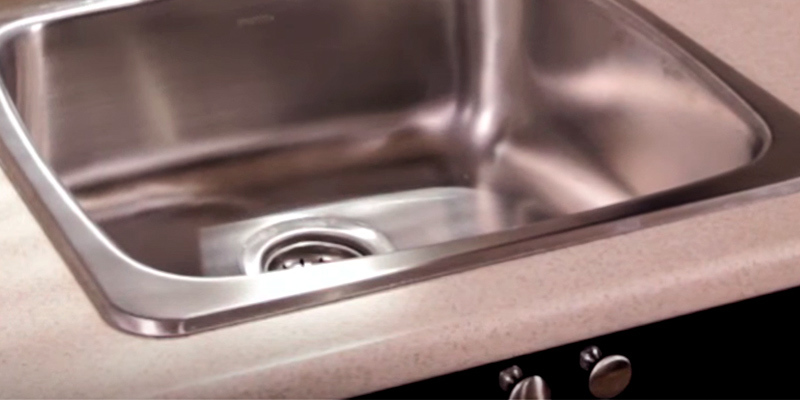 If you replace your old sink, you may need to check out the placement of the drain pipes. It'd be better to go for the sink that doesn't require making a lot of alteration. Q: Should I hire a plumber or I can install a sink by myself? A: Stainless steel, cast iron, copper or bronze kitchen sinks are not very heavy, so you can easily install them by yourself. Plus, there are lots of video-instructions to help you with that. But if you feel, you are not able to do it as well as a professional, or if you have chosen more bulky sinks like ceramic or granite, we definitely recommend you to hire a plumber. 1. Mary Jo Bowling How to Choose the Right Kitchen Sink, Houzz. May 13, 2014. 2. From the Book, Making a Home Selecting a Kitchen Sink, Better Homes and Gardens. 3. Alicia Garceau Choosing the Right Kitchen Sink and Faucet, HGTV. 4. How to Choose the Right Size Kitchen Sink, Overstock. 5. Nancy Mitchell Pros & Cons to Consider When Choosing Your Next Kitchen Sink, Apartment Therapy. September 9, 2016. 6. Jacob Ingram Kitchen Sink Buyer’s Guide, Homebuilding. June 16, 2015. 7. Sucheta Mehra Kitchen Sinks: Which materials to choose? Homify. April 01, 2016. 8. Mary Winn Ryan How to Choose Kitchen Appliances, HowStuffWorks.